A new HTC device was recently spotted in the Geekbench and AnTuTu databases. The device, which bears a model number 2Q7A100 seems to be powered by a Snapdragon 710 SoC and is equipped with 6 GB RAM and 128 GB of storage. Further details about the device and an expected launch date are elusive. We've been expecting HTC to launch a few devices in 2019 and the first signs of it are already being seen. 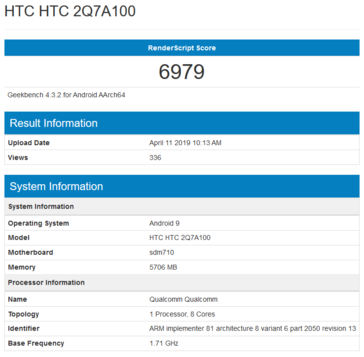 A mid-range HTC smartphone was spotted doing the rounds on Geekbench and AnTuTu. The model HTC 2Q7A100 seems to be powered a Qualcomm Snapdragon 710 SoC with 6 GB RAM and 128 GB storage running Android 9. The phone scored a score of 6979 in Geekbench's RenderScript test and 169617 points in the AnTuTu benchmark. Not much is known about this mysterious device apart from the fact that it will have a display resolution of 2160 x 1080 pixels. The Snapdragon 710 is an excellent upper mid-range chipset but Qualcomm has already announced the Snapdragon 730 as its successor. 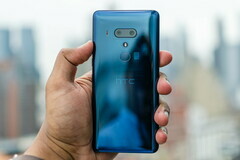 HTC could have rather used the new chipset, but it is possible that this phone has been in development since quite some time. HTC's journey so far has been riches to rags story. Revenues for the company have been tanking and the latest releases such as the U12 Plus haven't been able to really turn the tables despite being good devices in their own right. There have been absolutely no leaked pictures or renders of this new HTC device so we do not expect an official launch anytime soon. Still, it is good to see HTC not completely giving up its efforts and we hope the company delivers well this year.